Are you about to take the AAPC exam for Certified Professional Coder for the first time? Or are you one of the many people who FAILED the exam the first time, and are now looking to retake the test, perhaps for the third or fourth time? 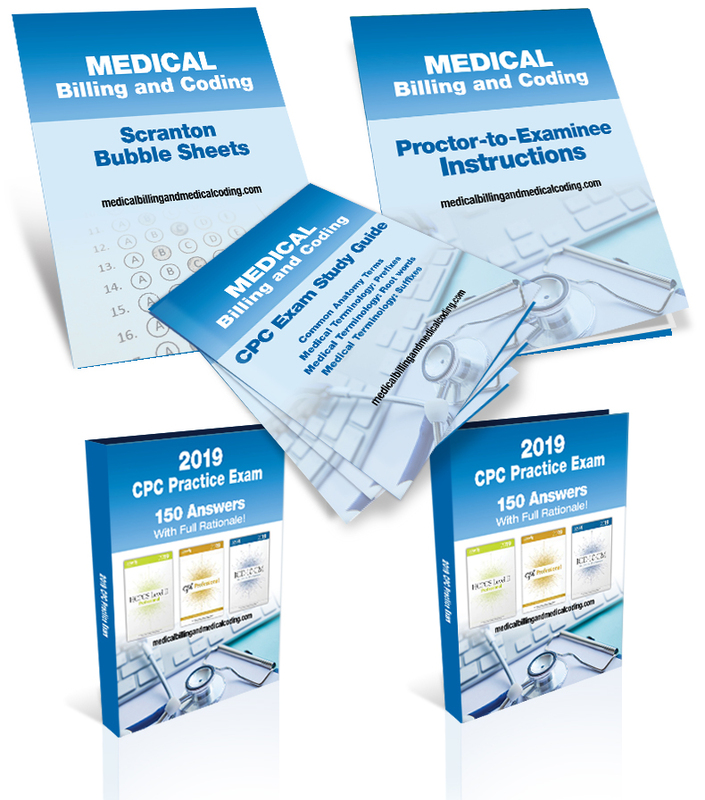 It's time to STOP doing what's not working, and get the CPC Practice Exam - Updated for 2019! "Outstanding! Worth every penny! I was so nervous about the exam when I ordered this practice one. I took it and wasn't too sure of how I did. My second try on the practice was much better! When I had to take my CPC exam (the real one) I opened the book and it was so similar... no surprises, which was nice. Would I recommend it? YES!" "I was impressed with the exam when I received it. I am going to use it as my final for the class I teach this fall. Very well put together." As soon as the 2019 coding books were released in late 2018, we went over the entire test with a loupe to make sure all the codes referred to in the answer key hadn't changed since last year. The test is now fully updated for 2019. 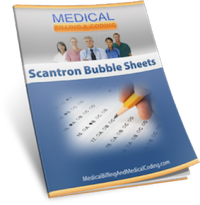 Already know our CPC medical coding practice exam is exactly what you need? Please click here to place your order. "I just sat for the CPC exam on Saturday. I don't know yet if I passed or not but I have to say the exam was very similar to the CPC practice exam I purchased through this site. I actually think the practice exam may have been just a tad harder. The questions were similar, it was laid out the same way, I was really pleased with how prepared I felt while taking the exam. I kept waiting for some "unknown" surprise to pop up but it never did, so thanks." A good practice exam should fully prepare its examinee for the real exam. Knowing what to expect and not being surprised on exam day are important. 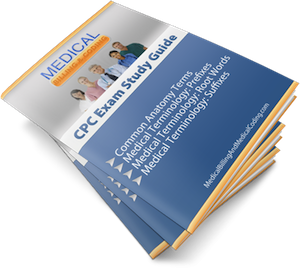 AAPC's CPC exam is 150 questions and must be completed in 5 hours and 40 minutes or less. Each of these three sections are then further divided into the following smaller headings. Our 150 question CPC practice exam was created using the structure listed above in order to emulate the actual CPC exam as closely as possible. We felt that by doing this examinees would know exactly what to expect on examination day. By utilizing this structure examinees can better prepare for the exam by focusing on category specific questions and identifying areas of weakness. Knowing what to expect in detail also tend to help calm pre-test anxiety. AAPC's CPC exam is 150 questions long. Questions range from true and false, to 1-2 sentences, to full page operative notes. We have taken into account the wide spectrum of diversity the CPC exam offers and have constructed the questions on our CPC Practice Exam to reflect those on the actual exam as closely as possible. In addition to our well constructed questions we are also providing a full rationale for each question. These rationales provide the correct answer for each question as well as a full explanation as of why this option is correct, why the other three options are incorrect, and where in the medical coding books the answer can be located. 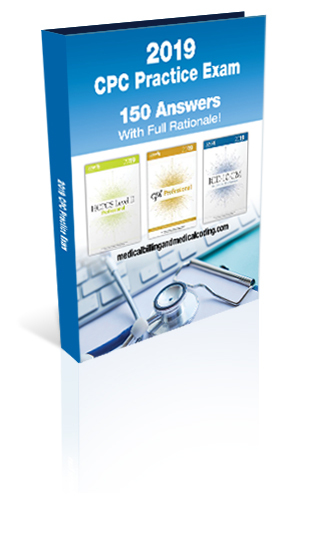 Studying the rationale of an answer may very well be the easiest and most efficient way to learn how to pass the CPC exam. this test is a bargain by any standard. Passing the CPC exam means, on average, a salary increase of $7,000 compared to uncertified coders. "I was privileged to take the CPC practice exam prior to its release and felt as if I were taking the actual exam. This had every detail right!" "The study guide provided a lot of useful information. Well worth the price!" Jim was at a bonfire when he tripped and fell into the flames. Jim sustained multiple burns. He came to the emergency room via an ambulance and was treated for second and third degree burns of his face, second degree burn on his shoulders and forearms, and third degree burns on the fronts of his thighs. Burn codes always have at least three codes: A burn code, a total body surface area code, or T31 category code, and an external cause code. Burn codes have the following rules, which can be found at the beginning of the ICD-10-CM manual under Guideline I.C.19.d Coding of burns and corrosions. Always code one location to the highest degree. For example, for first and second degree burns on the arm, you would only code second degree. When sequencing burn codes, always list the highest degree burn code first and end with the lowest degree burn code. For example, regarding first degree burns to the face and third degree burns to the arm, you would list the arm burn first and then the face burn. For question 33, answer B is correct because its codes describe the highest degree burn to each location and the burn codes are also arranged the in the correct order of highest to lowest degree of burn. To find the codes for the actual burns, we start with the areas with the third degree burns, in this case the face and thigh burns. Look up Burn/ face, and you will find Burn/ head. Burn, head, third degree is T20.30-. Search for Burn, thigh, third degree and you will find T24.319-9-. The second degree burns are for the upper and forearms. In the index, Burn, arm points to Burn, upper, limb. Looking up Burn, upper limb, multiple sites to code for both the upper arm and forearm, you will find that second degree is T22.299-. All of these need seven characters, with the seventh character being A, for initial encounter. The T31.42 (TBSA code) has the correct calculation when using the rule of nine (fourth digit burned to any degree; 9 x 5 = 45; five areas burned are head, arm1, arm2, leg1, leg 2; 5th digit describes only 3rd degree burns which are head (9), leg1 (9), and leg2 (9). 9x3=27). To find the code using the index, look up Burn, extent 40-49 percent with 20-29 percent third degree burns which points to T31.42. The external cause code correctly describes the bonfire incident. In the External Causes Index, look up Exposure, fire, not in building or structure which designates code X03.0. This also requires a seventh character of A, making the code X03.0XXA. Verify all codes in the Tabular. When does anesthesia time begin? The answer to this question can be located in the anesthesia coding guidelines under the title "Time Reporting"
"I learned a ton just from reading the rationale while grading my own exam. This is a must have prep. tool for aspiring coders!" "I just found out I passed the CPC exam and earned my CPC-A!!!!! Thanks for this practice exam, it was I hudge help in preparing and was very affordable!" 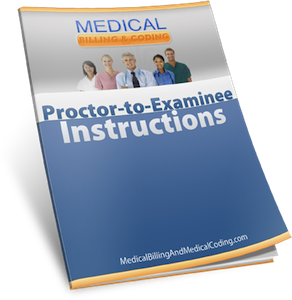 The CPC Medical Coding Practice Exam is delivered as an electronic download (in the PDF format), which means it's instantly accessible after purchase. Even if it's 11 pm and you are taking your exam tomorrow morning! It's priced at only $37.